This pen pays homage to George Parker and his love of traveling and traces back George Parker's travels around the world. Each one pays tribute to the Parker founder's relentless curiosity about the world, passion for travel and global cultures, and commitment to the art of writing. 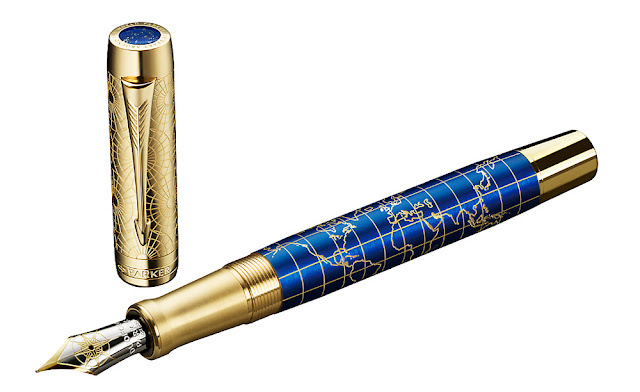 The body of the pen is made of brass and has a world map on it made of laser etched golden lines. The body is finished with deep blue colored varnish. 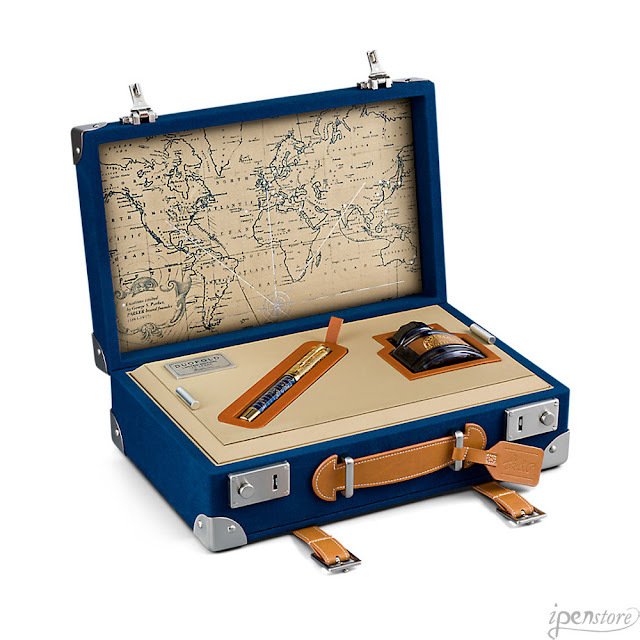 It comes in a very special packaging: a luxurious gift box inspired by vintage luggage. It has the Parker logo linished on it and features metal components. It has PU (polyurethane faux leather) latches and a nametag with George Parker's initials on it, based on his own handwriting. A map can be found on the inside of the box, with highlights of the cities That George Parker visited on his trip. The Special Traveler Edition presentation box includes a bottle of Parker ink. The nib is 18k sold gold and features a compass, eluding to the science of navigation and the steamships Parker used while traveling the world. The nib is Medium, but Fine, Extra Fine and Broad nibs are available on our Parker nib exchange program (call or email for details). Each pen is serially numbered on the bottom of the barrel. From Tahiti to Tonga, the New Caledonian Islands to China, George always used his faithful Duofold to document his experiences in a travel journal. He believed this not only preserved his memories, but also strengthened them. The thrill of traveling and his appreciation for global cultures inspired George's creativity and many of his iconic designs for Parker. This is adorable. This is the best idea for the gifts, i really love it. Eye catching idea. I wish i could order this. The article posted was very informative and useful. You people are doing a great job. Keep going. thank you for a great post. I really appreciate this wonderful post that you have provided for us! Thank you. Much obliged to you for sharing sublime data. Your site is extremely cool. I am awed by the subtleties that you have on this site. Custom packaging requires art and customboxeszone.com has the best designs and arts team.